Social anxiety group therapy can take many forms. One of the most common forms of group therapy for social anxiety disorder (SAD) is cognitive-behavioral group therapy. You probably have lots of questions about what group therapy will involve and how it will help you with your particular symptoms. You may even be questioning how being in a group of people—what you may fear the most—will help conquer your anxiety. If you have SAD, you have probably spent much of your life avoiding the social situations that trigger your anxiety. Your communication skills and confidence in your abilities have likely suffered as a result. This leads to poor self-esteem and increased anxiety. Group therapy is a great place to build social skills and reduce anxiety in a non-threatening environment. Plus, other people with SAD may be some of the nicest people you will ever meet. A bonus that comes from participating in a group is the chance to meet others with the same problem. Although not everyone will have the same triggers or severity of symptoms, it is helpful to know that you are not alone. The group situation also lets you role-play situations that would be too threatening to face right away in real life. This comforting and safe environment is great for building confidence in your social skills before unleashing them on the “real” world. You will usually be referred to a therapy group by your doctor, psychiatrist, psychologist or other mental health professional. 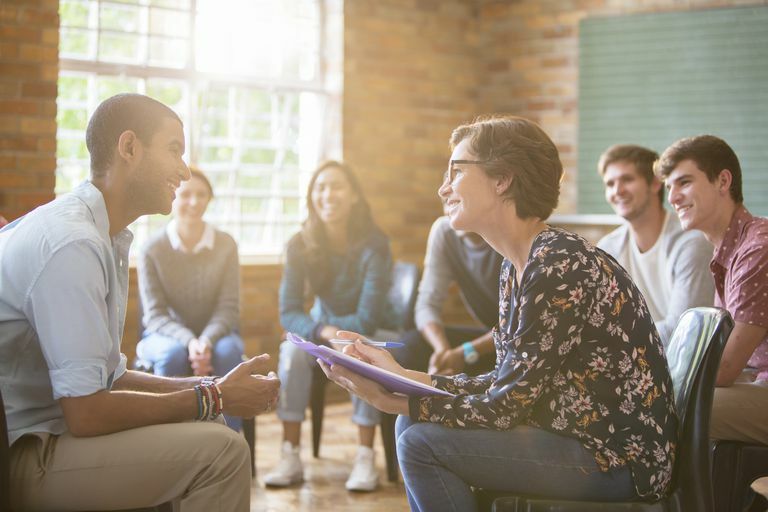 If you have been recently diagnosed with SAD, your doctor or therapist may have already recommended that you attend cognitive-behavioral group therapy for social anxiety. If you haven't already discussed your options with your doctor about ways to cope with your social anxiety disorder, try to have a conversation about your diagnosis and treatment options, including group therapy. Otherwise, you can look for therapy groups in the yellow pages or through your local or national anxiety disorders association. Group therapy is generally covered by medical insurance but it is best to check with your insurer about the specifics of your coverage. If you were to attend the ideal group therapy for SAD, what would it look like? Below are some of the features one would expect from a great group. The group should consist only of people with social anxiety disorder. The treatment protocol for SAD is different than it is for other disorders, even other anxiety disorders. Ideally, the group would consist of no more than six people and would be led by two therapists. This allows for enough individual attention for each group member. Ideally, the group would be of mixed age and gender to allow for more role-playing scenarios. Since not everyone will have the same fears, the sessions should be structured so that each person can practice the situations that are problematic for them. In terms of the therapist(s) leading the group, ideally, that person(s) will have a thorough knowledge of social anxiety disorder and experience delivering cognitive-behavioral group therapy. During an initial visit with your therapist, you may want to ask about his/her experience with the disorder and with group therapy. If you aren't comfortable asking these types of questions, it may help to bring a family member or friend along to support you. Family members do not usually take part in cognitive-behavioral group therapy. However, they can play an important role in assisting with homework assignments and helping monitor and reward your progress. Typically, treatment will consist of 12 to 24 weekly sessions. In the first session, the therapist(s) will present the cognitive-behavioral model of SAD and the rationale behind treatment. During later sessions, the group will focus on three main components: in-session exposure, cognitive restructuring and homework assignments. Exposure takes place either in-session or in the real world. Exposure disrupts the cycle of anxiety by allowing you to stay in a feared situation long enough on repeated occasions that you feel a natural reduction in anxiety. Through role-playing, the group can serve as the audience for a nervous public speaker, the boss for someone afraid of asking for a raise, the romantic interest for someone afraid of asking people out on a date—you get the idea. Cognitive restructuring generally occurs before, during and after exposure (both in-session and in the real world) and gives you the chance to test dysfunctional beliefs. You will be asked to evaluate whether your thoughts are helpful and to entertain more adaptive ways of viewing feared situations. In a group setting, the therapist will ask you what you are feeling or thinking as you go through exposure. Homework will generally ask you to face real-life situations that were simulated during role play. You will also be asked to reflect on how you handle your anxiety during real-life exposure. This way, you take on the role of therapist and learn to think adaptively. Some groups may even take field trips to practice in real life. For example, for the person afraid of being the center of attention, take a trip to the local shopping mall. Sit in the food court. Then have group members sing "Happy Birthday" to help the person get over her fear. At the end of group therapy, you may feel a little nervous about your ability to keep up what you have learned. Some groups may offer booster sessions over the months after treatment. If at any point you feel that your symptoms are returning, a few additional sessions are often all that are required to regain the improvements that you made. Heimberg RG, Becker RE. Cognitive-behavioral group therapy for Social Phobia: Basic mechanisms and clinical strategies. New York: Guilford; 2002.